Wooden doors are elegant, traditional, and lend a bit of natural beauty to any home. But unlike other types of doors, it’s very apparent when something happens to damage them; scratches or stains can be glaringly obvious. So how are you as a homeowner supposed to care for your front door? 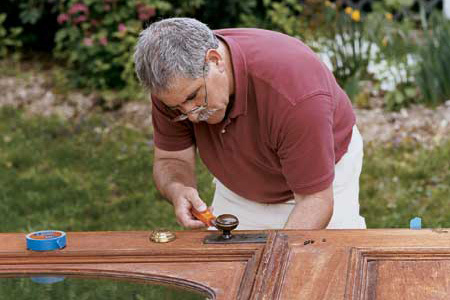 Fortunately, repairing cosmetic damage to a door is relatively easy to do. Water stains can mark wood extremely easily, but they don’t have to. If the stain is still relatively recent, then you can solve the problem by placing a dry towel over the stain, and smoothing it with a warm iron. The heat will draw the moisture out of the wood grain—just make sure you don’t touch the iron directly to the door or burn the wood. Although water stains are a pain, oil stains can be even worse. If you have an oil stain, let the stain dry. Then rub a little bit of lacquer thinner into the wood, working with the grain, and then lightly sand the door. You may have to do this a few times to make the stain disappear. If your door has scratches or dings, then you can cover them up with an oil-based furniture touch-up marker, which allows you to return the lighter areas to their original stain. Simply color in the blemishes with the marker and then gently wipe away the excess. Touch-up markers can be found at many hardware and furniture store, but if you can’t find one, then you can also use walnuts or Brazil nuts, which have natural oils that darken the wood. Simply rub the meat of the nut over the wood until the scratch disappears, and wipe off the extra oils. If your door has a small dent in it, then you can use the iron again. This time, though, you want to make sure that you apply water to the door beforehand, and that the rag or towel you place under the iron is damp. The moisture and heat will help the grain swell and lift, concealing the dent. Once you have ironed the wet wood a few times, use a dry towel with the iron to remove the moisture and prevent a water stain. Finally, sand the area smooth to remove any trace of a dent. Your front door is one of the first and last impressions that most people have of your house; you’ll want it to look its best. Although minor damage can and does happen, fixing that damage is a simple process—with a couple handy tips and a few minutes of work, you can keep your door looking great.